A single car MVC injured two adults Tuesday afternoon 28-February. 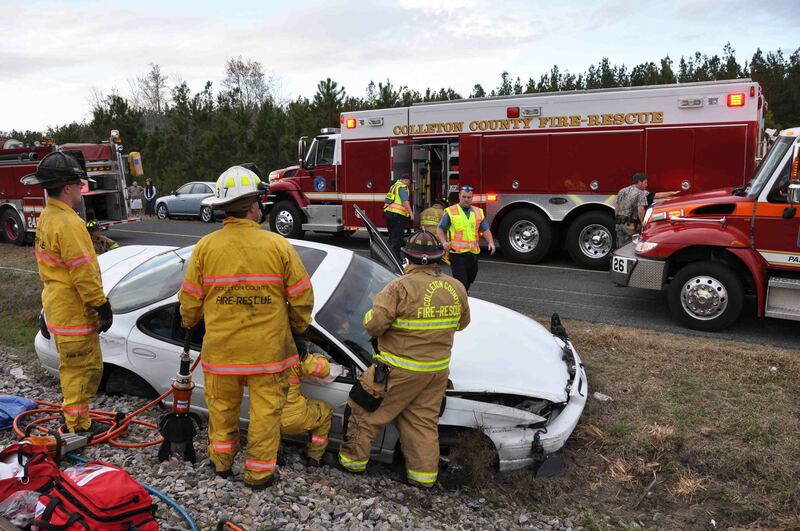 At 17:00 a Pontiac Grand Am left the roadway on Ruffin Road west of Wolfe Creek Road and impacted the railroad bed. The car reported flipped over, receiving moderate damage. The male driver was able to exit the vehicle, suffering only minor injuries. Click here for additional information. An early morning fire destroyed a vacant seven unit, single story apartment building in the 5600 block of Ritter Road Tuesday morning 28-February. The fire was reported at 01:30 with the caller advising the flames were coming from the roof. Engine 6 arrived nine minutes later to find the building fully involved. Most of the roof had already collapsed...click here for additional information. We express our sincere condolences to the family of Firefighter-Paramedic Brian Rowe. Brian’s brother in law, Thomas W. Cronin, passed away Friday in Montana. Please remember Lisa, Brian and their family in your prayers. A memorial service will be held in the near future. Neighbors in the 100 block of Crestview Lane reported hearing a loud explosion, followed by heavy smoke coming from behind a residence at 128 Crestview Lane, Sunday afternoon 27-February at 13:59. Responding units could see a thick column of black smoke from three miles away. 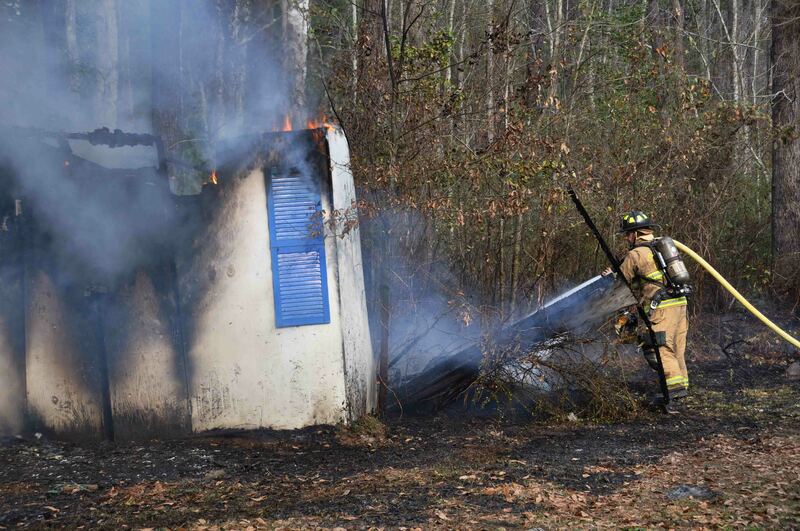 Engine 19 arrived to find a well involved garage, a fully involved passenger car, an approximately 2 acre woods fire...click here for more information. An unattended debris fire spread through a yard in the 100 block of Paps Place Sunday morning at 11:36. The fire was pushed by light winds onto the adjacent property, destroying a older farm building and reaching a singlewide mobile home. Engine 18 arrived within minutes and was able to stop the fire from reaching the mobile home. 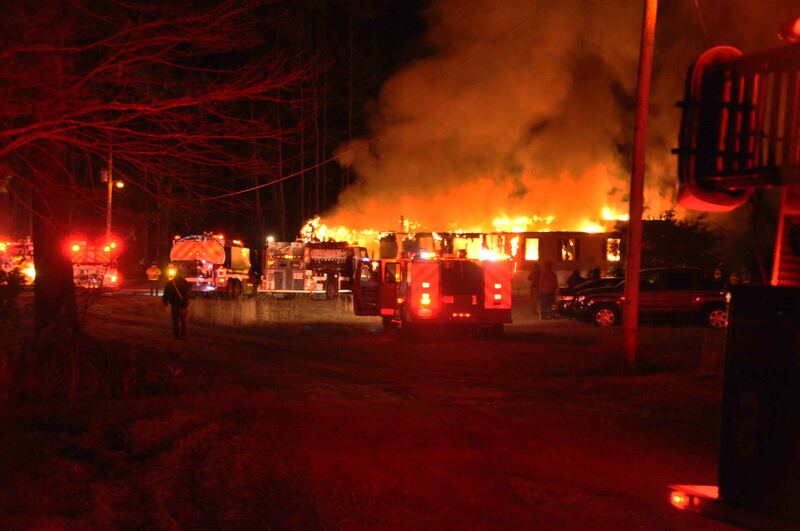 They used a deck gun to knock down the flames on the farm building...click here for more information. We would like to congratulate Firefighter-EMT Andy (Jasper) O’Quinn and his wife Megan on the birth of their second son. Carter Allen O’Quinn was born Saturday and weighed 8 pounds, 2 ounces. He was 20.5 inches long. Both mother and child are doing well. 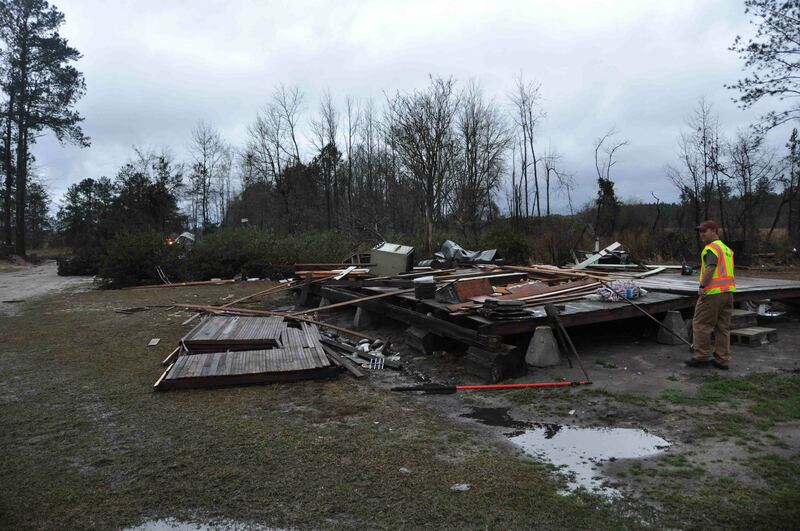 A tornado touched down in the Islandton Community destroying one structure, damaging several homes and knocking out power to the area for several hours. The first report of the incident was received at 17:29 Friday evening 24-February, reporting a tornado on the ground in the 500 block of Jamison Court. Several other callers reported damage in a northeasterly direction crossing Sniders Highway. Click here for more information. High winds and dry conditions made conditions right for multiple woods fires throughout the County Friday afternoon, before heavy rains help douse the flames. Eight rapidly spreading fires were reported in a three hour period before the thunderstorms rolled through. 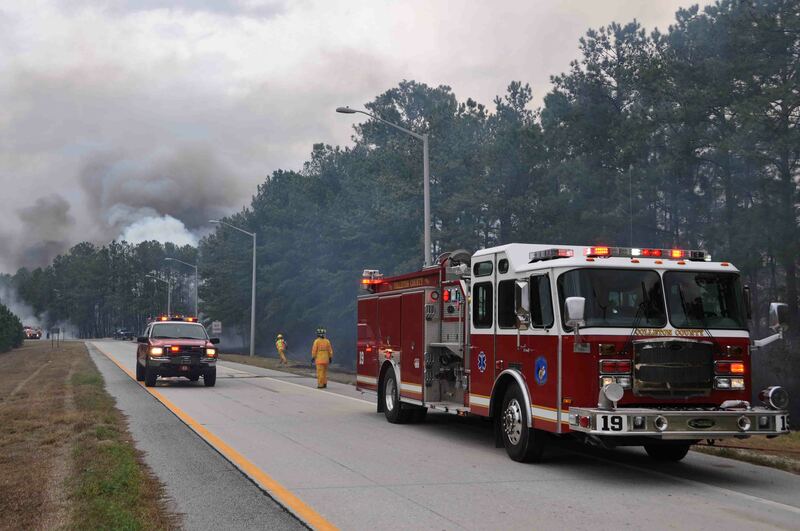 The second response, but the largest fire, occurred near the intersection of McLeod Road at Interstate 95 at 13:35.... Click here for additional information. 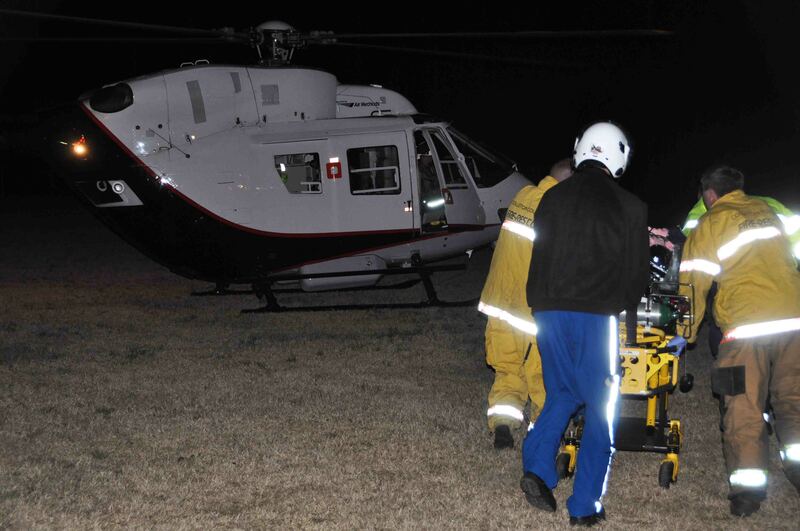 A medical emergency required air evacuation Thursday morning 23-February at 10:18. Medic 18 responded to an address on Big Easy Drive to a man suffering from a medical emergency. 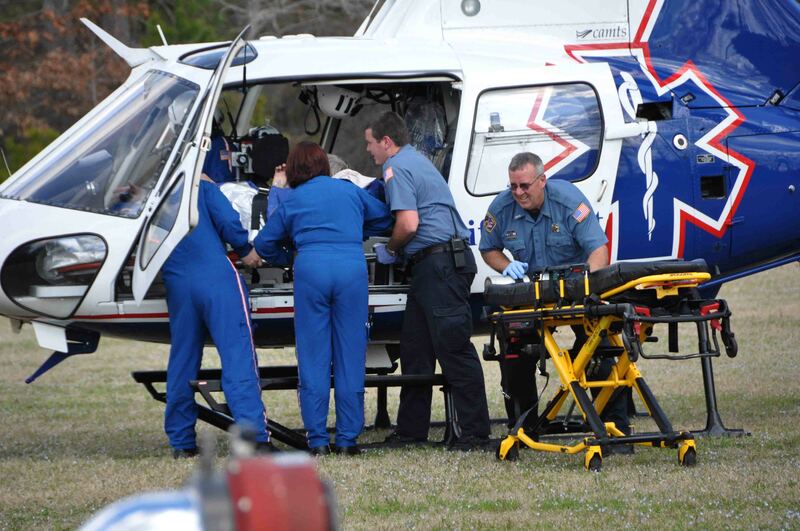 The man had been receiving care at MUSC, which was not available at Colleton Medical Center. 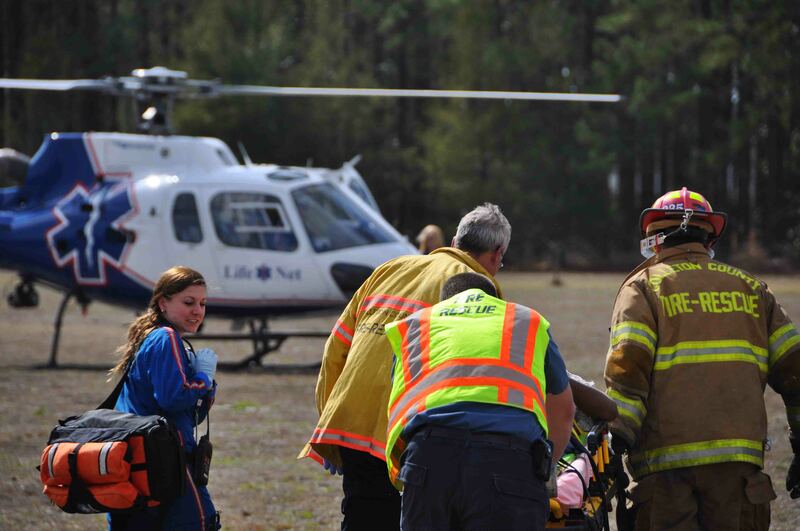 After conferring with the ED Physician at CMC, Medic 18 was directed to fly the patient to MUSC. Click here for additional information. When Battalion Chief Ben Heape volunteered to be a “Red Cross Hero for Fire Victims”, he had no idea the project would be as successful as it turned out. 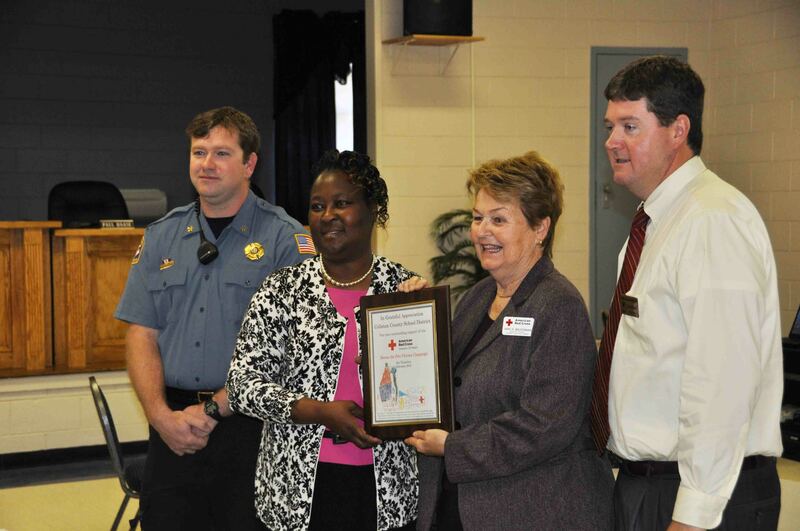 The success was made possible by the Colleton County Students and the partnership of the School District. Heape met with School Officials in late 2011 to pitch the idea of having the students participate in the fund raising efforts. Click here for additional information. 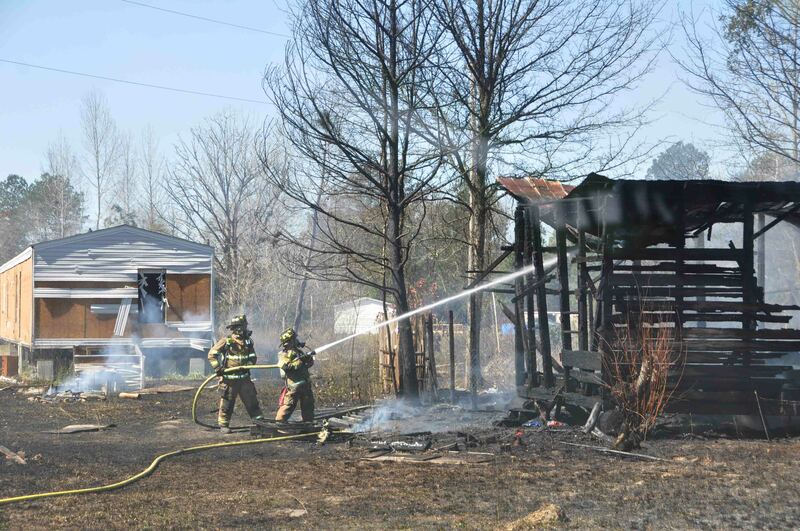 An early morning fire destroyed a mobile home in the 2400 block of Pine Grove Road Wednesday morning 22-February. Fire-Rescue was notified of the fire, located on the rural road near the Hudson Mill Community at 00:49. Engine 31 arrived to find what appeared to be a debris pile and a full-sized van on fire. The fire was located approximately 100 feet off of the road. Click here for additional information. The Highway Patrol is investigating a single vehicle crash in the 600 block of Rhode Drive north of Cottageville. The accident was reported at 18:11. Medic 9 arrived to find the older model Ford Ranger pickup truck standing on its nose against several trees. The driver who received several non-life threatening traumatic injuries was already out of the truck and walking around the scene. Click here for additional information. Fire-Rescue responded to a fatal , high speed single car MVC in the 100 block of Wood Road in Green Pond, Saturday morning 18-February. The accident was reported at 06:56, just off of Green Pond Highway (SC Hwy. 303). A 2009 Chevrolet Malibu driven by an unidentified male, left the roadway in a curve and struck several trees. The impact caused the vehicle to flip over several times. Click here for additional information. 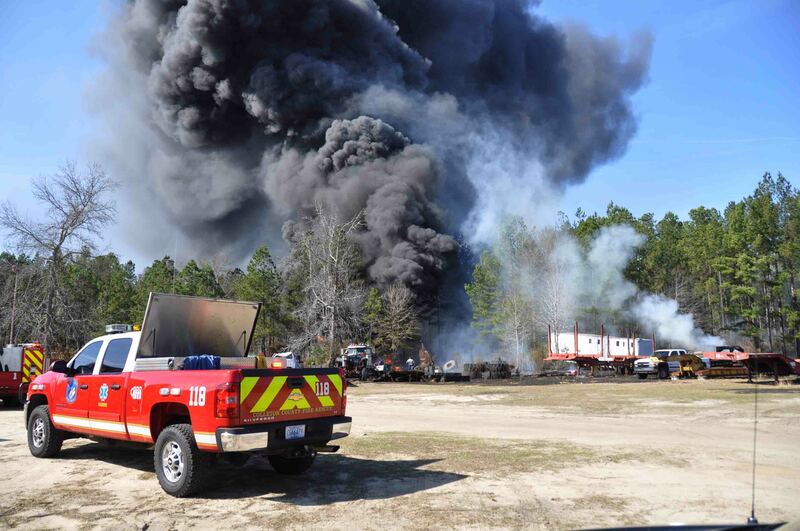 A dozen Colleton Firefighters responded as mutual aid to assist eight other fire departments with a large commercial structure fire at Simmons Truck Stop/Golden Crown Motel located in the Town of Yemassee in Hampton County. 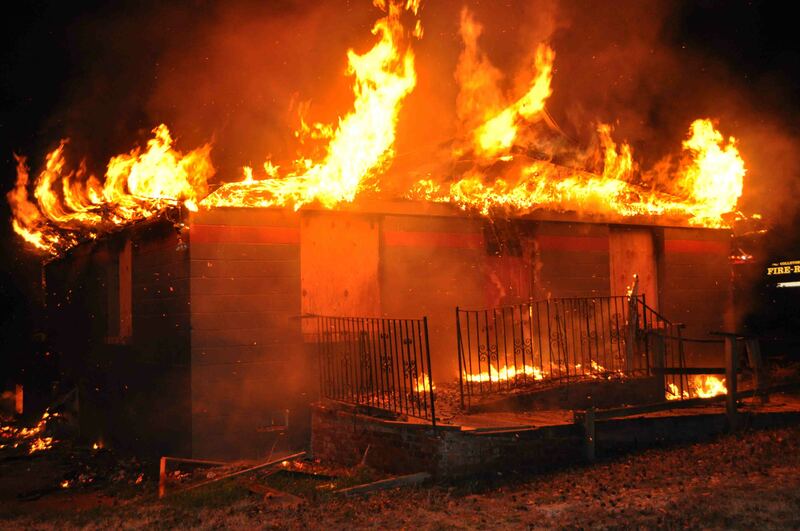 The mutual aid request came in to the Colleton 9-1-1 Center at 04:54, Wednesday morning requesting personnel and Tenders for a commercial fire...click here for more information. CCFR is conducting a research study in conjunction with Oklahoma State University. If you are a CCFR Volunteer Firefighter and would like to participate in the study, click here for more information. 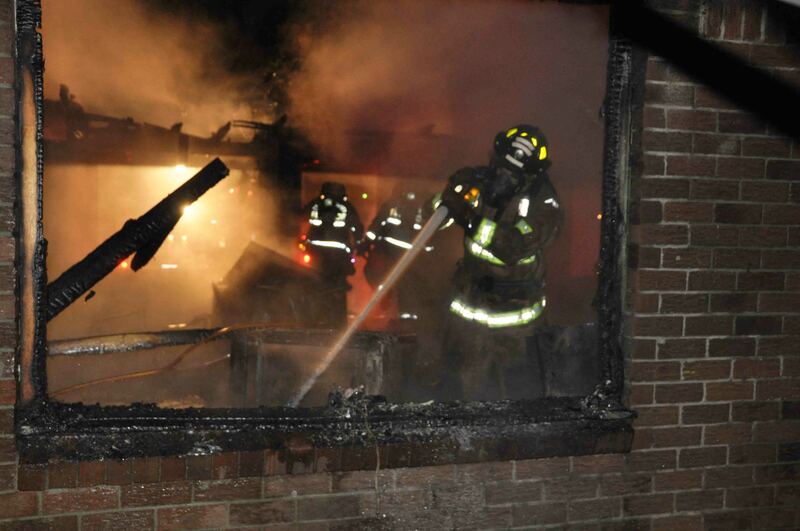 A home located at 271 Phoenix Circle was destroyed in an early morning fire Wednesday 15-February at 01:43. Engine 18 arrived shortly after the dispatch to find the single story dwelling fully involved. Engine 18 requested additional Tenders for water supply. The roof and most of the interior walls had already burned away, leaving the brick veneer. Click here for additional information. An adult male died from traumatic injuries he received after he was ejected from his car in a single vehicle MVC. 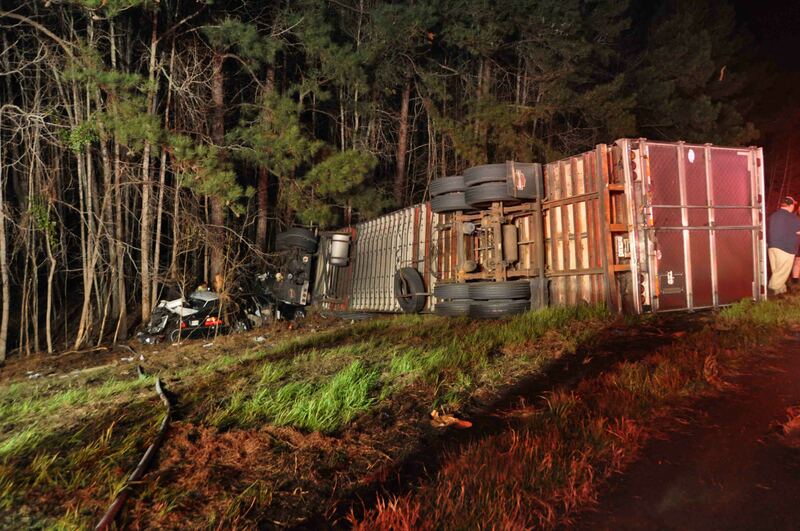 The accident was reported at 00:33 when a Sheriff’s Deputy enroute to another incident, drove up on the accident. Apparently the northbound Chevrolet Prism left the roadway near the end of the four lane at the 5000 block of Jefferies Highway... click here for additional information. An early evening fire destroyed a residence at 125 Dodge Lane south of Cottageville Tuesday 14-February. The family returned home around 19:11 to find the 32x80 doublewide mobile home well involved.The residence was located in a remote area, down a long narrow dirt road and was not visible from the highway. Click here for additional information. One person was trapped in her small SUV following a two car collision in the 500 block of North Jefferies Blvd., Tuesday afternoon 14-February at 12:07. The accident occurred in front of the Hardees Restaurant after the SUV collided with a mini-van, then struck a metal pole. 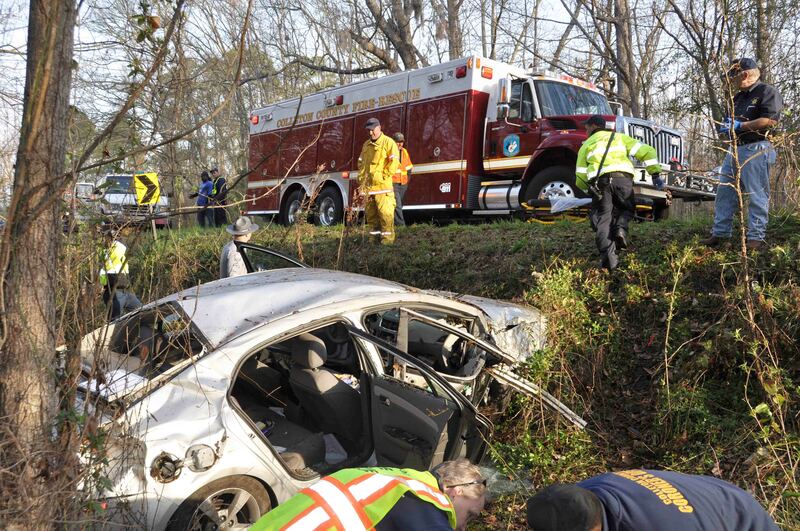 The female driver suffered several non-life threatening traumatic injuries. Click here for additional information. A Monday evening vehicle accident involving three vehicles has left one man critically injured and sent another person to a Trauma Center. 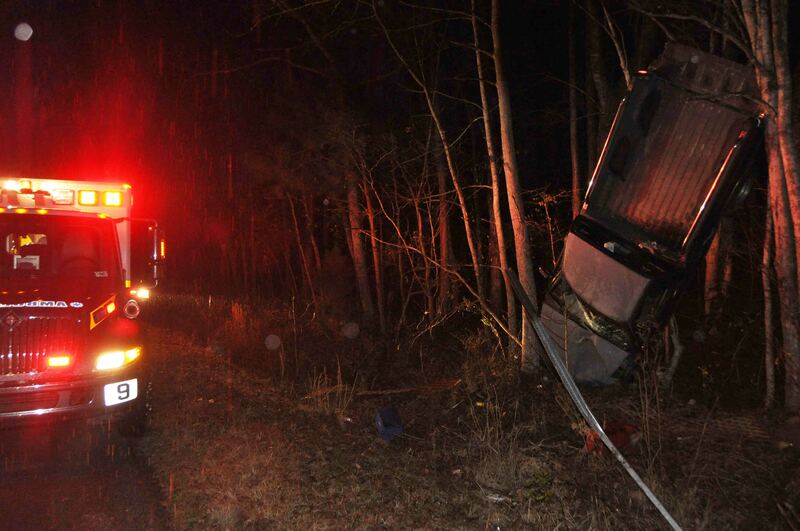 The SC Highway Patrol is looking for the vehicle that may have caused the accident. The pickup truck did not stop following the crash. Fire-Rescue was alerted to the high speed accident in the 12000 block of Charleston Highway (SC Hwy 64) west of Jacksonboro at 18:29. Click here for more information. 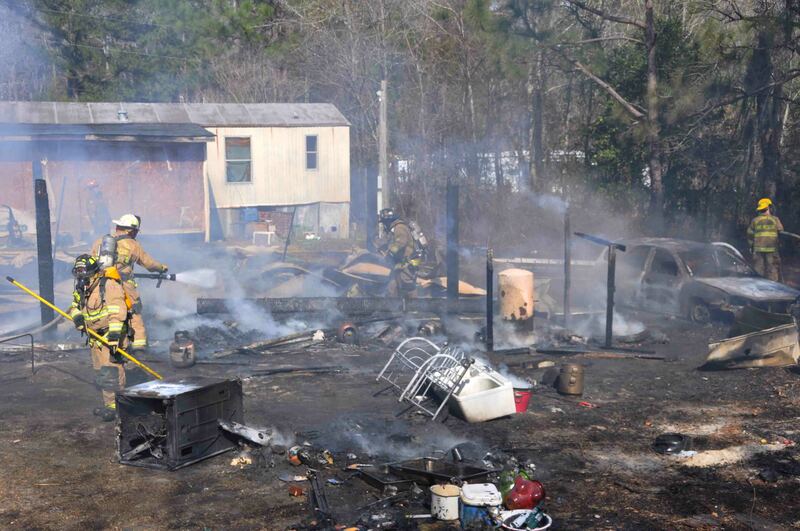 Two vacant singlewide mobile homes were destroyed in the 2000 block of Heirs Corner Road Sunday evening 12-February. The fire was reported at 20:07. Both trailers were located next to one another on a lot near Interstate 95, generating multiple reports from travelers on the highway. Engine 26 arrived to find one mobile home already on the ground and the second about 50% involved. Click here for additional information. 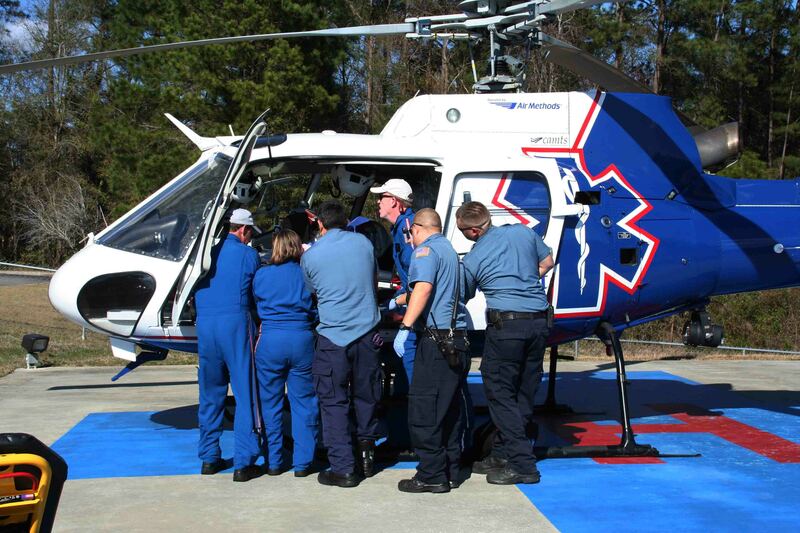 One woman was flown to a Trauma Center following a single car MVC in the 2000 block of Cayce Road Saturday 11-February at 12:06. The 2000 Chrysler mini-van left the roadway after a curve and struck a tree. The van received heavy frontend damage. Medic 18 arrived to find the 55 year old female driver entrapped in the car. She was conscious, but suffering from multiple traumatic injuries. Click here for more information. We wish to express sympathy for Billing Manager Chasidy Lawson on the loss of her grandfather. Ms. Lawson’s Grandfather passed away Friday morning after a long illness. His funeral services will be held in Jacksonville FL on Monday. Please remember her family in your prayers. 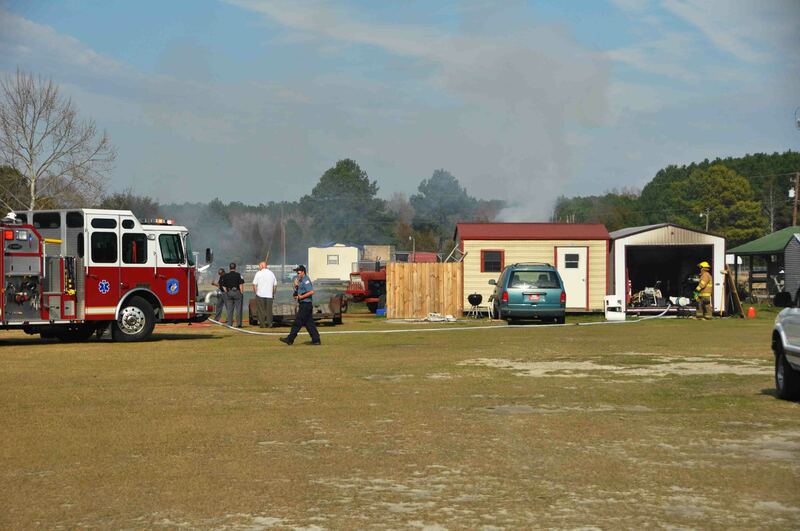 A burning vehicle damaged two storage buildings located at 3987 Possum Corner Road Wednesday afternoon 08-February at 14:25. The incident was reported as a vehicle fire, however when Engine 1 and Medic 1 arrived, they found heavy smoke coming from two storage buildings as well. The Chevrolet automobile was behind the structures and fully involved. Click here for additional information. The family of John Waddell will received guests on Friday 10-February from 14:00 to 20:00 in their home located at 319 Warren Street. At the request of Mr. Waddell there will be no funeral conducted. We offer condolences to Firefighter James Waddell and his family on the loss of his father. Mr. John Waddell passed away this weekend at the SC Medical University Trauma Center following complications of injuries received in a motor vehicle collision several weeks ago. We will forward information regarding funeral arrangements as we receive them. Please remember the Waddell family in your prayers. 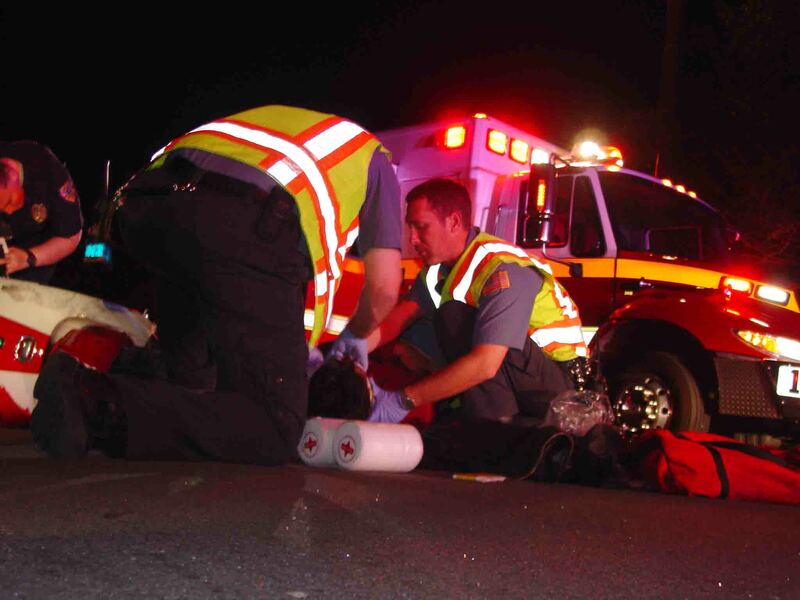 At 01:12 Sunday morning 05-February, an adult male received multiple traumatic injuries after his moped collided with a vehicle at the intersection of Wichman Street and Savage Street. Medic 19 found the man lying in the roadway with obvious lower extremity injuries. The driver of the car was not injured. 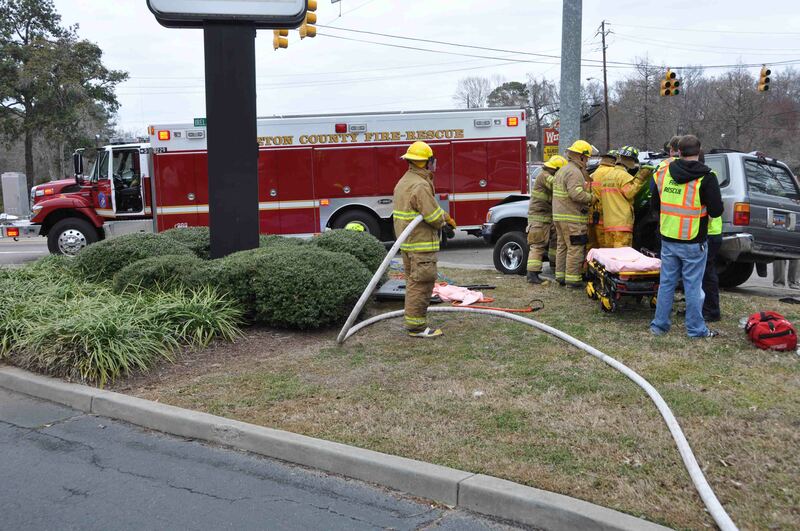 The man was treated at the scene and immobilized, then transported to Colleton Medical Center in stable condition. Click here for additional information. 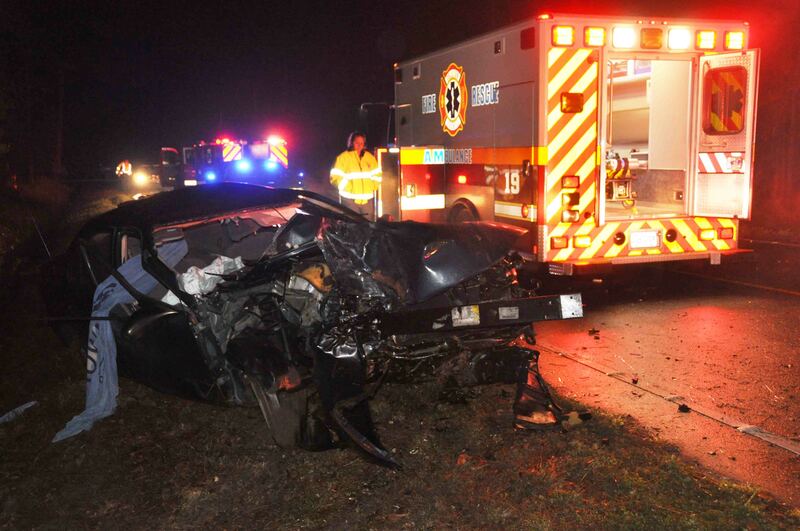 A multi-vehicle accident injured nine people on I-95 near the 55 mile marker northbound Sunday morning 05-February. 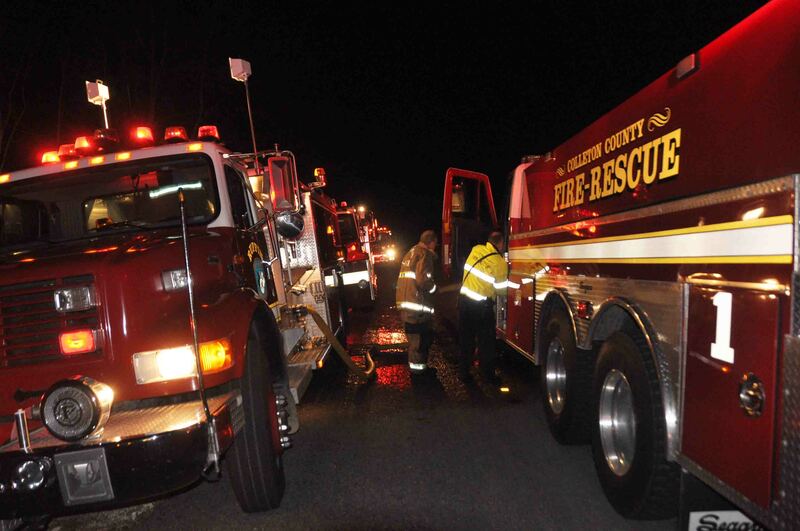 Fire-Rescue units were notified of the three vehicle crash at 00:02. A second caller advised one vehicle was a tractor trailer, which had over-turned and was on fire. Engine 1, Medic 1 and Battalion 1 arrived to find the vehicles in the median with heavy damage. Click here for additional information. There will be a softball practice held at 14:00 on Sunday February 12 for anyone who is interested in playing for Colleton County’s teams in the Emergency Services Softball Tournament. The practice will be at the Recreation Center north of Walterboro. The tournament is to be held at the Recreation Center on March 24. As of right now, it will only be a one day tournament. If you are interested in playing, are unable to make the practice or have any questions, call either Brian Drew (843-909-3417) or Robbie McAlhaney (843-560-6187). There will be other practices conducted closer to the tournament date. 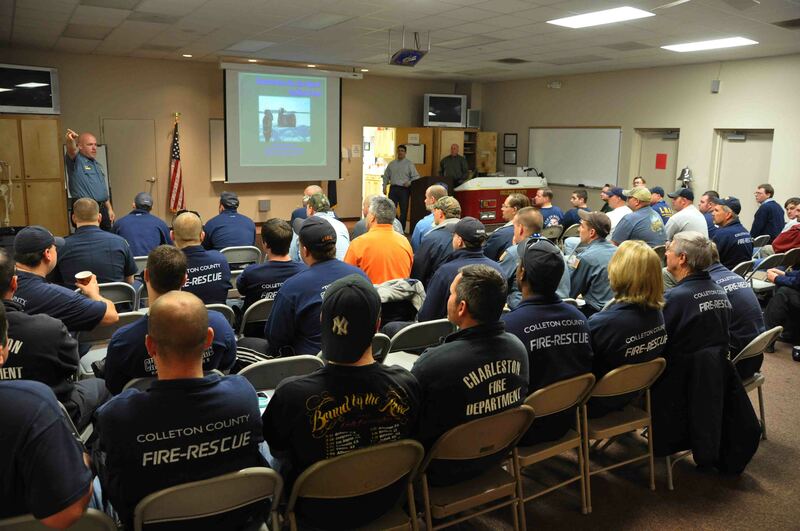 Fire-Rescue hosted a one day seminar on New Vehicle Technology and operating with a short staffed crew, Saturday 04-Februaury at Station # 19. The course was taught by Mr. Aaron Heller of On Scene Training in New Jersey and Mr. Carl Haddon of Five Star Training of Idaho. The first three hour segment provided information on operations involving a short staffed crew...click here for additional information. A grass fire destroyed a 12x12 storage building Friday afternoon 03-February at 14:45. Firefighters responded to 1805 Green Pond Highway to find the small structure full involved. Engine 8 deployed one 1-3/4 handline to extinguish the fire. 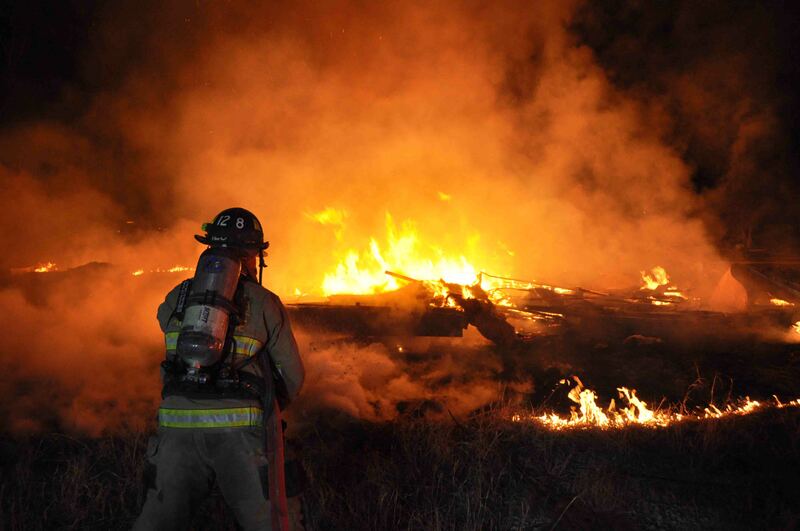 The fire originated from an unattended yard debris fire that spread due to light winds. Click here for additional information. 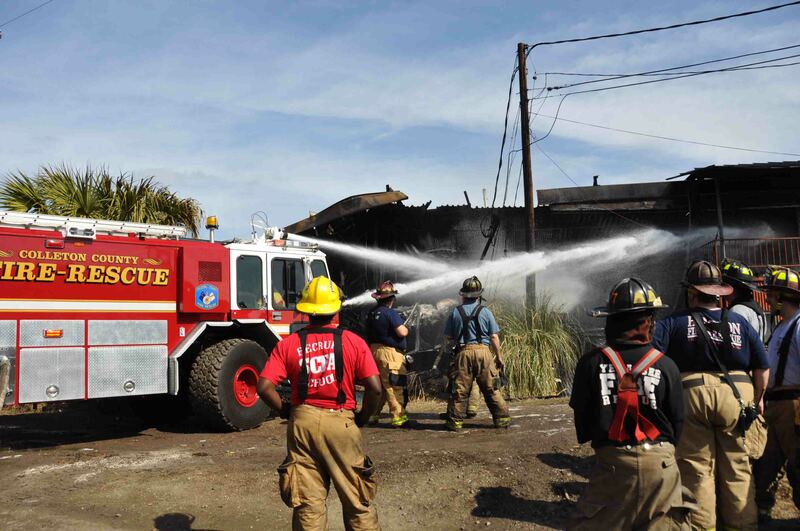 At 12:15, Thursday 02-February, a wind driven grass fire quickly escalated into a two alarm fire that burned approximately 5 acres of woods, damaged several pieces of machinery, an office building and destroyed approximately 300 truck and large skidder tires. The fire originated when embers from an unattended burn barrel ignited surrounding grass. Click here for additional information. 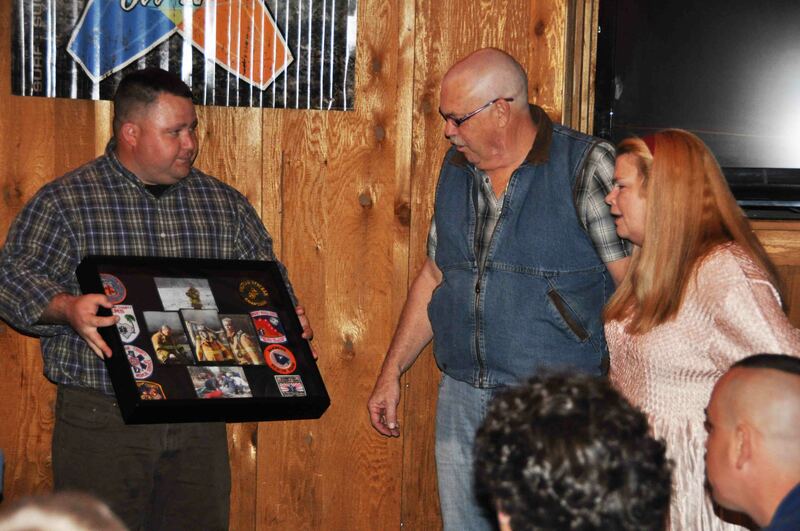 After 44 years of providing emergency medical care to others, Firefighter-Paramedic Henry “Hank” Williamson has retired. Hank worked for Colleton County since the late 1990’s in a part-time capacity with the former EMS Department and came on full-time in 2004 as that department was integrated into Fire-Rescue. Click here for additional information. An adult male received a acute electrical injury while working on equipment at a cell phone tower site off of the 100 block of Mount Batten Road, Thursday afternoon 02-February. The incident was initially dispatched as a man being injured by an explosive device with a severe hand injury, however that was not the case. Law Enforcement also responded. Click here for additional information.